Northland’s autumn rural property market was unremarkable. Although listings are readily available, including some excellent farms, purchasers and their financiers are reluctant to meet vendor price expectations. A 36.5 hectare Kaipara property growing kumara sold in April for $43,000 per hectare. Interest in the region’s developing avocado sector continues to rise, with orchards transacting between $300,000 and $350,000 per canopy hectare, and the possibility of up to 1,000 hectares of new orchards identified for avocado planting in the Far North. 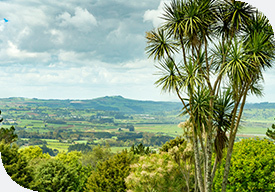 As in other regions, Northland dairy farmers are conscious of increasing requirements around environmental compliance, though on generally heavier soils, they are less likely to be seriously affected than their counterparts elsewhere. Rural property activity through the winter is likely to focus on preparation for spring sales, which, assuming the current payout forecast is confirmed, should be steady. Waikato dairy farms sold in autumn at similar quantities and values as they had 12 months earlier, although a gap appears to be developing between better quality farms and those less well located or contoured. A 95 hectare Cambridge dairy farm, which sold at auction in May for $120,000 per hectare, demonstrates how keen demand is at the top end of the market. Based on good lamb and beef prices and excellent weather, conditions for the region’s pastoral farmers were close to perfect and, as a result, there has been more late season sale activity than normal. Consequently, Waikato market activity through winter is likely to be slight, as those who were motivated to sell have already done so. With every indication that these factors will prevail, market activity should re-energise in spring, with values likely to remain at similar levels. Kiwifruit dominates the Bay of Plenty’s rural property market. Autumn sales of the most sought after gold G3 orchards reached $1.1 million per canopy hectare. With Zespri issuing new licences, bare land suitable for horticulture is in great demand. A 138 hectare Paengaroa dairy farm, with 80 hectares fit for kiwifruit, sold in April for $5.9 million, well over double its value as dairy land. Other dairy farmers are assessing this opportunity, and orchardists are keen on properties that will give them scale. On the Central Plateau, without horticulture, dairy property is selling less readily as tighter banking criteria have made obtaining finance more difficult. Farms that have sold range from $27,000 to $36,000 per hectare. Several drystock properties also sold in the autumn, between $10,000 and $16,000 per hectare, with greater demand for farms suited to dairy support. Autumn rural property activity through Taranaki, Wanganui, Wairarapa, Manawatu and Horowhenua increased somewhat on what had gone before. After a tough summer, with few listings or sales, an increased number of farms were offered for autumn sale. Some positive transactions resulted, particularly of small farms. As in other regions, uncertainty around dairying consents, slowly emerging government policy, and future regulations focused on environmental sustainability created uncertainty, inhibiting those who might otherwise seek to buy dairy land. This is likely to prevail for a few more months. Meanwhile, sheep and beef listings are tight as farm owners prefer to make the most of positive commodity returns rather than sell up. A traditionally quiet winter is therefore indicated in the lower North Island, as farmers evaluate their options ahead of spring, rather than pre-empt that and go to market earlier. Several good sheep and beef farm sales featured in Hawke’s Bay through the autumn, with values ranging from $8,500 to more than $10,000 per hectare. Most of the properties transacted were medium hill country farms ranging from 400 to 800 hectares. While prices are encouraging, in most cases, these properties were purchased to augment existing farms. Values reflect that highly motivated neighbours with the resources to increase their holdings are the main group of purchasers. Despite firm indicators that sheep and beef farmers will continue to do well in the coming months, with rural property listings largely exhausted, a subdued winter market is likely. However, as this is the season to prepare a farm for spring sale, and several Hawke’s Bay farmers have already indicated that is their intention, spring should herald a buoyant market, with firm values prevailing.